We have been renting and servicing Film and Digital Cinema Cameras, Cinema Lenses and related equipment since 1979. We are the largest and most experienced camera rental house between Los Angeles and Vancouver BC. We serve the entire Pacific Northwest region, including Alaska and Western Canada. We feature responsive customer service, great support, a machine-shop and advice that will make us a part of your camera team. We are here to be your problem solver! Whether the question is where to find a piece of gear or an experienced crew member, we will help you get to a solution. We carry industry standard Digital Cinema Cameras like the Arri Alexa, Red Epic, Sony F65, Sony F55, Canon C300 and more. Our equipment provide HD, 2K, 4K, 5K, 8K or High Frame Rate capabilities. If you prefer to shoot on Film, we offer a wide range of Super 35mm and 16mm Film Camera Systems too. All of our camera systems can be complimented with Angenieux, Canon, Cooke, Fujinon, Zeiss and Specialty Lenses. We are able to customize or design the systems you need with our in-house machine-shop and our great team. We also provide grip equipment, a 39.4ft cinema crane or audio and lighting equipment. If Aerial work is on your call sheet, we have you covered with Aerial Exposures and Tyler Aerial Mounts. When it comes to Aerial needs, we can help you to find an experienced pilot, the right aerial mount, and camera system to get the shots you want, in the format you want. Our trained technicians, years of experience, extensive local inventory, and commitment to customer service will give you Production-Peace-Of-Mind. Whether from our own inventory, or sourced outside the market, Oppenheimer Cine Rental can meet all of your needs for Film and Digital Cinema Cinematography. 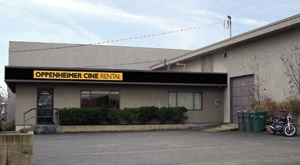 Choose the most experienced camera rental house in the Pacific Northwest with Oppenheimer Cine Rental! Opening hours: Monday to Friday 9:00 a.m. to 6:00 p.m.